The Deer Isle-Stonington Chamber of Commerce is one of the Island’s most vital organizations. Directed and run by volunteers, our Chamber strives to promote and enhance the community’s diverse businesses through a variety of means including publication of the annual Island Guide. 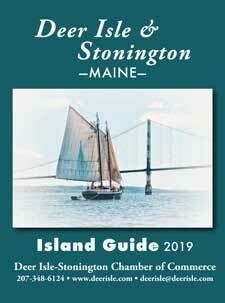 Over 15,000 copies of the Guide are distributed throughout the State of Maine at State Visitor Centers, via mail, at our Welcome Center and our members businesses. The Chamber sponsors an annual spring birding Festival: “Wings, Wave & Woods, a weekend of birding by land, by sea and by art”; DIS Fridays; 4th of July parade and fireworks; and other events. The Chamber also serves as a clearing house for information on all aspects of Island life, state and national Chamber programs, tourism and opportunities for business growth such as the BuyLocal – HireLocal campaigns.